It is not communist, in fact, it is more toward capitalism. 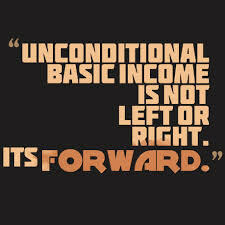 The core of basic income is that it is giving only livable amount of money - that you cannot afford luxury. If you want a better lifestyle, then have to go to work. The pro side is - you can now follow your passion without worry about food or shelter. More startup will be expected and people can now chase their dream without worry about their parents or children. For those poorly paid job such as garbage collector, now they can say no to their boss as they are being paid a penny if compare to their poor working condition. Currently they are unable to bargain because they are threaten by hunger. With the implementation of UBI, then economic rule will finally correct - the employers have raise the salary in order to have them working in such poor condition, or make the working environment better. I'm a supporter for UBI, most of the reason that I support for UBI can be found at reddit/basicincome. The evolution of deep learning method, has caused a spike in automation performance - such as auto driving car, robot written news and etc. One of the famous video describing these technology evolution is human need not apply. The solution to solve this problem is to introduce UBI, so that most people still have income, while keeping the motivation to work in order to have more.